Frank Gardner, the laconic Australian racing driver, one of the most popular and charismatic personalities on the British motor racing scene in the 1960s and 1970s, was a respected, tough and uncompromising competitor who raced in a wide variety of cars. It was in touring cars that he achieved his best performances. He won the British Touring Car Championship in 1967 at the wheel of a Ford Falcon V8, driving for the Byfleet-based Alan Mann racing organisation. He then repeated the achievement the following year at the wheel of one of the newly unveiled Ford Escorts. 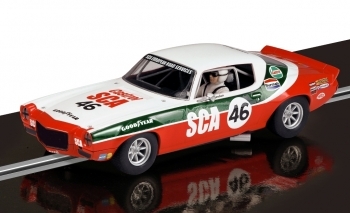 In 1973 he would win the title for a third time in a fearsomely powerful 7-litre Chevrolet Camaro. Powered by ShopFactory to sell P2334 online. All-in one eCommerce and online shopping cart software.